Unless you subscribe to my posts (which you really should *g*), this game is probably hovering well under your radar, as it did for me until I stumbled on it in a GeekList. The very concept of this game set my heart racing in anticipation. Fortunately for my heart, they completed their translations and posted the rules a few days later. If I had to compare Khronos to other games--from simply reading the rules--I would probably list Euphrates & Tigris, Elasund, and Tikal. But it really doesn't play much like any of them. There is a board consisting of a 20x16 grid. Upon this grid, the players build 9 different types of building. There are Military (orange), Religious (purple), and Civil (blue) buildings. Each comes in 3 sizes (1x1, 2x2, 3x3), and has its own building cost. Buildings are built using cards from your hand. Small buildings can be destroyed as well. You can also upgrade a building to a larger size if there is space for it by paying the difference in cards. When you build any 2x2 or 3x3 building, you earn income. There are 3 special rules governing the locations of buildings. The Rule of Geography: Depending on the number of players, forest/mountain spaces cost extra. 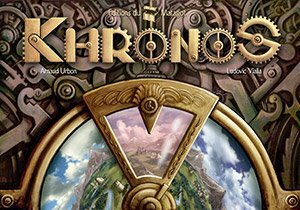 Rather than simply restrict the playing area for fewer players like so many games do, Khronos allows you to use the entire board...for a price. This is very clever. There's also a river running through the center of the board. Only Civil buildings can be built over these spaces. The Rule of Dominion: Only a Civil building is allowed to be built in such a way that it connects previously disconnected buildings. The Rule of Hierarchy: In a given group of buildings, the largest sized Military and Religious buildings must be unique. For example, there cannot be two 3x3 Military or two 2x2 Religious buildings. When a player causes this rule to be broken, one or more buildings in violation must be destroyed or downsized. This can cause local ripple effects. Players place cubes when they build Military and Religious buildings to indicate ownership. At the end of each player's turn in the 4th and 7th turns, each player collects income from groups of buildings in which he holds certain types of control. Now hold on. At this point you are saying to yourself, "Big freakin' deal." Right? Of course, there's a catch. There are actually 3 boards, each as I described above, each identical. Except for one really important thing: each board exists in a different time period. The 1st board is the Age of Might where Military control earns income. The 2nd board is the Age of Faith where Religious control earns income. The 3rd board is the Age of Reason where Civilian control earns income. The 3 boards are linked in time. Changes in the past affect the future. For example, a Keep (2x2 Military building) built in the Age of Might immediately creates an identical building in the Age of Faith and a ruin of it (flipped tile) in the Age of Reason. Each player controls 2 adventurers who can travel between the time periods to build, upgrade, destroy, renovate, and populate buildings. There are even paradoxes. If you build a building on an empty location "now", and it ripples into the future into a building (sharing at least one space), the future building is removed (forgotten)! Because the layout can be different across the 3 boards, violations of the Rule of Hierarchy can get fairly complex. The rules are available, but are not in the best shape. Unfortunately, they have already been printed. I'm sure they will make updates available once the game is released. There are going to be lots of rules questions. I'm kicking myself for not thinking of this idea myself. I know there have been other games dealing with time and time travel, but Khronos just seems to really click for me. Whoa! Under the radar is right but it does sound very interesting. Thanks for bringing it to my attention! The artwork looks very nice too. This certainly looks/sounds like something I'd enjoy! I'm always enamoured of time travel stories, most recently memento and The Butterfly Effect are the best movies I can think of in the genre. And who didn't like the Back to the Future series?